When working with large regional models you may find it difficult to manage as the associated file can become quite large. Additionally, you may be interested in doing further modeling - but only in a smaller area of the large regional model. Extracting a subgrid from your large regional model allows you to work with a smaller model in the area of interest. You will find the option to Create a subgrid in the Numerical Workflow on the View/Edit Grid step. By extracting a subgrid - all existing inputs (for example: inactive cells, properties, boundary conditions, observation wells, zone budget zones, and particles) that are in the existing grid will be transferred to the subgrid. Outputs are not transferred. Visual MODFLOW Flex only supports extracting subgrids from Finite Difference grids. 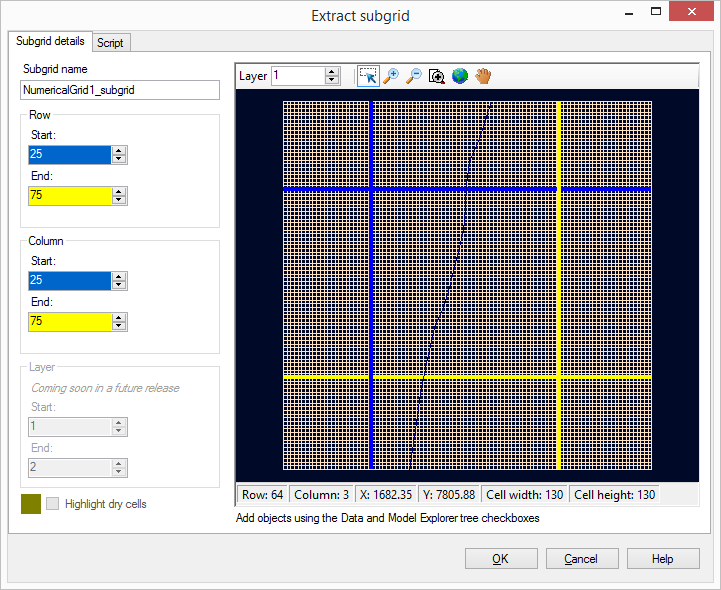 USG and Finite Element grids do not support extracted subgrids. By default a Subgrid name will be provided but you can adjust this. You can adjust the Row start and end as well as the Column start and end to define your subgrid. It may be helpful to load objects (from the Data and Model Explorer) to help you define your subgrid - simply select the appropriate checkbox and they will be displayed in the subgrid preview in this dialog - for example a River has been added to the subgrid preview in the above image. Currently all Layers will be included in your subgrid. In future versions you will be able to a select a subset of layers to include in your subgrid. You can highlight the dry cells in your model display in the subgrid preview. This can be helpful to ensure that no dry cells land on the boundary of your subgrid. Please be aware that the boundary of your subgrid cannot fall on cells that are dry (from the regional model run). You must adjust the extents of your subgrid to ensure no dry cells fall on the boundary. Once you have defined your subgrid extents and select OK you will find the new subgrid (with corresponding model) will appear in the Model Explorer as well as a new Numerical Workflow will open. 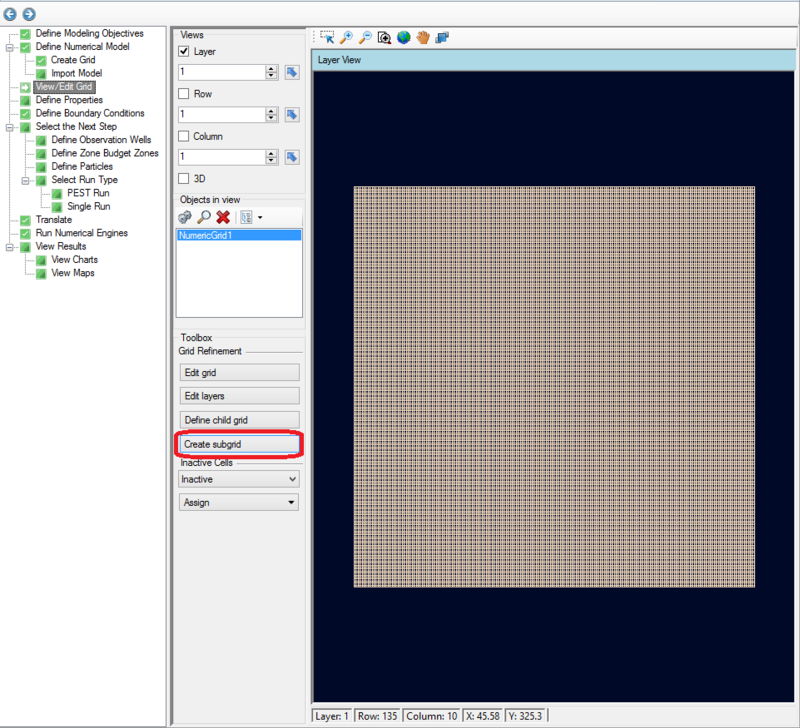 Select the subgrid in the Model Explorer to have it display in the new Numerical Workflow. As mentioned previously, all inputs from the original grid will be transferred to your subgrid. Additionally, the subgrid will contain constant heads all the way around the perimeter with assigned heads values from the original model. 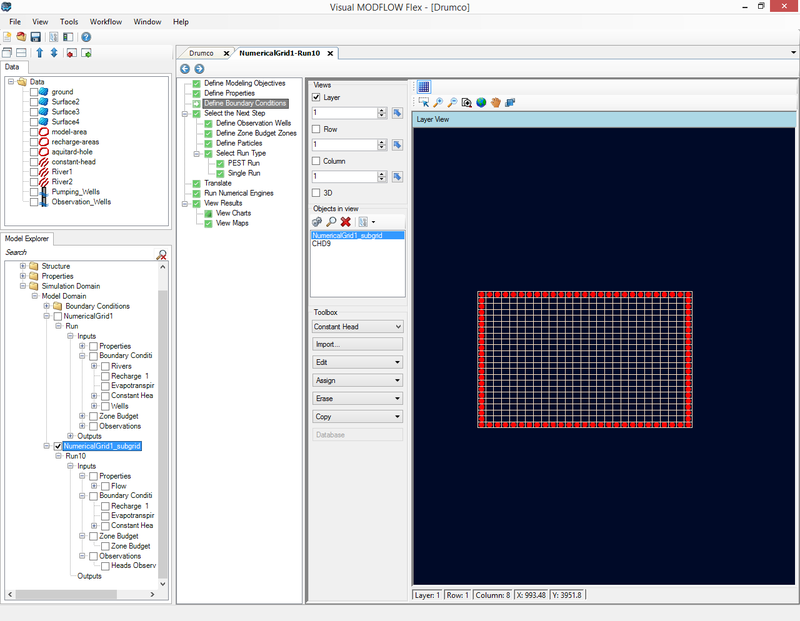 From here you can continue to develop your new model based on your subgrid extraction.